THREE TIME ZONES ON A DIAL ! Launched in January 2018, The Tourbillon Edouard Bovet is another « beauty » developed by the Maison Horlogère. Well, it’s quite clear that the piece has three times zones on one side and one on the other but actually, there are some interesting details that i want to share. Let’s start with the general information. The central hands show the local time. On the left & right are 2 additional time zones showing (on top) the main city of each segment. They are easily adjustable thanks to two correctors present on each side of the Amadeo case. Patented in 2010, the Amadeo case is convertible. 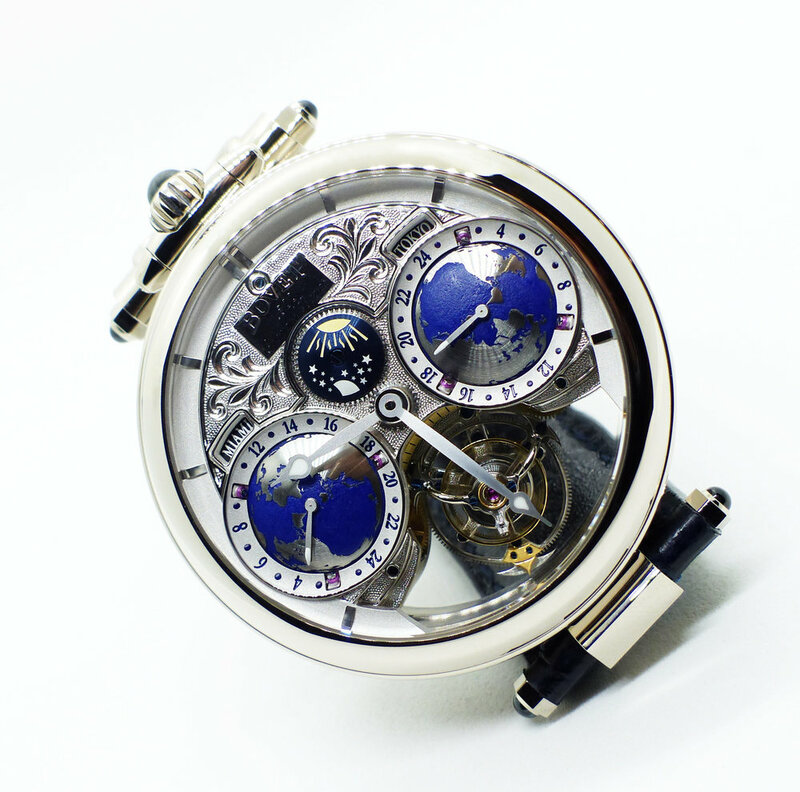 Therefore, the timepiece can be a small table clock or pocket watch. The fact that the local time is visible on both sides of the creation makes it also reversible on the wrist. A day/night indication is present below the brand’s logo at 12 o’clock and the seconds are shown through the Wonderful Flying tourbillon at 6 o’clock. Last point, there is a power reserve indicator on the « blue » side (between 8 and 9 o’clock). 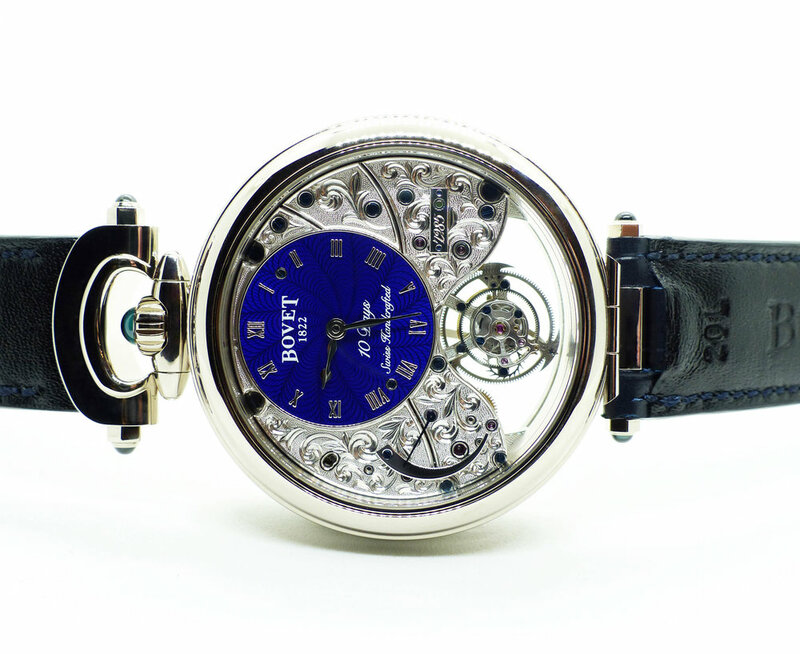 Here is an interesting thing, the piece has a power reserve of 10 days using only one barrel! Yes, only one… That’s quite an achievement knowing that eight hands and three hemispherical displays depend on it. Such quality in terms of finishing & decoration requires for sure a true savoir-faire and passion! That’s a constant point at Bovet and i really appreciate it. I had the opportunity to discuss with one of their engraver and it was pretty impressive to feel how he loves his job.